It is known as the Carta Marina, an ancient map drawn by Swedish cartographer Olaus Magnus in 1539 that accurately depicts the North Atlantic, including land masses, islands and even sea swirls that are astounding the scientific community. Oceanographers at Plymouth Marine Laboratory and the University of Rhode Island were surprised when they discovered that swirls drawn on the map by that 16th Century artist correspond almost perfectly with thermal eddies caused by the Gulf Stream passing the cold waters of the arctic. While the existence of these eddies, known as the Iceland-Faroes Front, have been known by mariners for hundreds of years, their location in North Atlantic waters was only recently pinpointed with the help of satellite imaging from space. 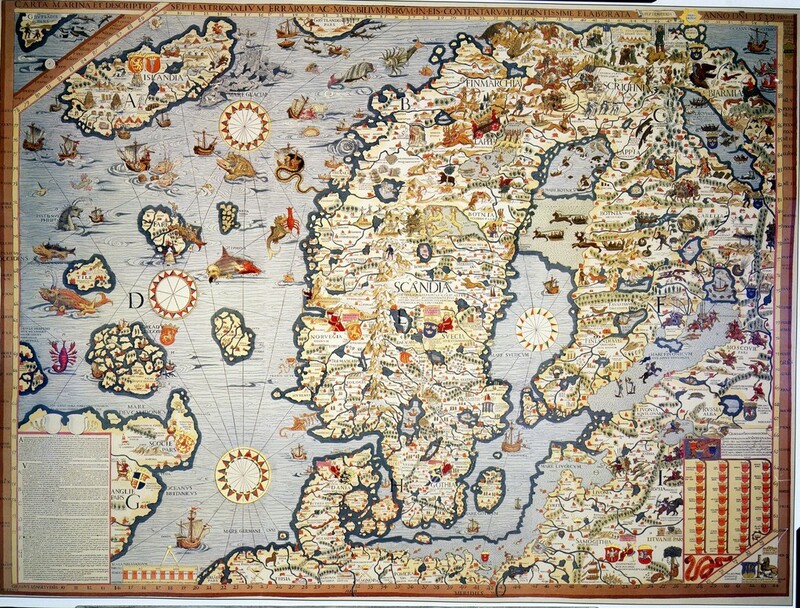 That Olaus Magnus, a Swedish priest living in exile from his own land in Italy, captured the exact location of the front with what appeared to be artistic sweeps of his pen, appears more than mere coincidence, suggests Professor Tom Rossby at the University of Rhode Island. For a map maker/priest who apparently had no personal knowledge of the sea, the Carta Marina was amazingly accurate for its time. The work took 12 years to complete and it shows towns, lakes, regions and lands with proportions that are unexpectedly correct. For example, the map shows the Baltic Sea, the Finnish Gulf and the Gulf of Bothnia. It also depicts Northern Scotland, the Hebrides, Orkneys, Faroes and Greenland in elaborate detail. And it shows an island that does not exist….a place called Tile, located near St. Kilda in the Hebrides. Did such an island exist over 400 years ago and if so, what happened to it? While the creation of an amazingly accurate map by an artist working in a room somewhere in Italy surprises contemporary science, there is a logical explanation for the work in esoteric circles. The work of Olaus Magnus was a right-brain function. It proves in a dramatic way that humans have always had the ability to use their minds to gather information from the collective unconscious library of all human knowledge. This man did not need to sail the length and breadth of the North Atlantic to draw an accurate map of it. Nor did he need the wisdom of the many mariners who returned home from the sea. All that was necessary was for the artist to tap into the collective while his pen was busily drawing what he saw in his mind. What he apparently did was conduct an early version of contemporary remote viewing. The amazing story here is that he could accomplish what he did in Italy, from the heart of the Christian church and in the midst of what is known as the Renaissance Period.